EVITA. 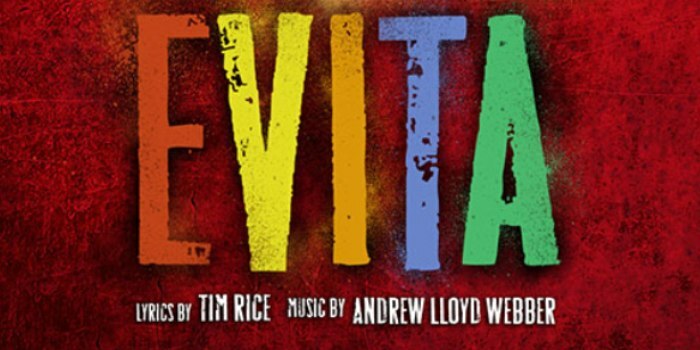 Music by Andrew Lloyd Webber; lyrics by Tim Rice; directed by Patrick Sawyer. Produced by Candlelight Dinner Playhouse (4747 Marketplace Drive, Johnstown) through Nov. 13, 2016. Tickets available at 970-744-3747 or www.coloradocandlelight.com. EVITA is built around the short but memorable career of Eva Duarte Peron, who went from ambitious dance-hall girl to first lady of Argentina beside her husband, Juan Peron. During the six years she was by his side (1946 through 1952), she became involved in charitable and political causes, gaining a reputation as one who cared for the underdog. Webber’s musical version of her life does not necessarily paint her in a favorable light, but she was named Spiritual Leader of the Nation by her people shortly before her death in 1952. Her story continued even after her death when Juan Peron suffered a military coup and lost the presidency. Eva’s body, which had been preserved and on display, was removed and hidden for 17 years before finally being recovered and returned from Italy to Argentina when Peron once again took power. Her real story is as dramatic as the theatrical story. Up until now, HELLO, DOLLY had set the bar of excellence for me for Candlelight productions. But this EVITA has met that bar and may have moved it up a little. It was strongly directed, told the story without pause, pulled together all parts of the production—technical, aesthetics, music, movement—into a cohesive whole that pleased the audience. And—get this!—we saw the understudy for Eva perform. Having seen Joanie Brosseau-Beyette (the everyday Eva) do the role before, I was somewhat disappointed to learn that we weren’t going to get to see her in this performance. But I must say Mica Dominguez-Robinson did a fantastic job in a difficult role. With only one or two exceptions, Eva is on stage for the duration and in nearly every song in some fashion. She even changes costume on stage when there is no break in the music. Mica may have been out of breath when the show was over, but there was no hint of nervousness, inexperience or lack of preparation in the performance observed. Kudos! While the tightness of the performance can be credited to director Patrick Sawyer, he was ably assisted by the crisp, precise choreography of Stephen Bartles and the inventive set designed by Shauna Johnson. A unit set with movable parts that rolled on and off as needed kept the story moving forward effortlessly. The lighting by Benjamin Abernathy added greatly to both the joyful and mournful parts of the production. The sound design by Mark Derryberry perfectly balanced the orchestra pit to the singers, allowing both the lyrics and the music to come through. New to Candlelight is band conductor Nicholas Gilmore, who seems to have brought in extremely talented and professional musicians to add a whole new dimension to the musical support of the singers. They provided everything from a strong military drum cadence to lyrical string and orchestral accompaniment to Webber’s music. Kudos again all around for this talented team! Special notice must be given to the costumes designed by Debra Faber. They subtly signaled Eva’s rise in society from cheaply-made dance dresses early in her career through to the iconic white and silver Inauguration gown. In one scene, as she moves upward through lovers, she appears on stage in different dressing gowns illustrating a little more money, a little more style with each progressive farewell. The costume crew came up with authentic looking uniforms for Peron’s generals, breakaway clothing for the peasants, and haute couture for the later Eva. A daunting task well accomplished. But OMG, you guys, this night belongs to Matt LaFontaine. As Che Guevara, the narrator of the story, he plays with the audience, gets in Eva’s face and holds her feet to the fire, prances up and down off the stage, watches as the story unfolds and makes his own comments on the happenings in an offhand, caustic style. His confident delivery, faultless articulation and ease with the proceedings are such a joy to watch. His evolution from thorn in the side to sympathetic comrade is beautiful to behold. In truth, there seems to be no evidence that Che ever met or interacted with the Perons. Although he was born in rural Argentina, during the years that Eva and Juan were enjoying the fruits of the Presidency and traveling the world, Che was actually traveling South America on a souped-up bicycle, and in 1952, while Eva was dying, he was floating down the Amazon on a raft from the leper colony where he had been volunteering. But Che’s later revolutionary beliefs and role in the Cuban Uprising cemented him as a symbol for the underrepresented of every nation and secured his place in this story of the abuse of power. The factual history doesn’t get in the way of this excellent production of an beautifully written score. As always, the kitchen pleased with an Argentina-flavored menu that included empanadas, Polo al Disco, an excellent Mushroom Tilapia and a Milanesa Napolitana featuring veal and ham with creamed greens. Desserts featured Medialuna, Chocotorta, Alfajore and a Passionfruit crème brûlée. Did you ever in your wildest dreams think you could order from as diversified a menu as that from a dinner theater? Check out Candlelight. You won’t be disappointed.